I can’t explain exactly why, but I have been fixated on blondies for Valentine’s Day lately. But I just couldn’t bring myself to cut these into heart shapes (feel free to, though, or go for these instead), nor infuse them with beet juice until they were festively pink. I just wanted a really killer blondie, so that’s what we have here. See that touch of red in there? That means they’re totally perfect for Valentine’s Day (don’t overthink it). But they’re not so syrupy sweet – literally or figuratively – that you can’t just make these any time. Aside from Valentine’s Day, acceptable reasons for whipping up a pan of these include: it’s a long weekend/your cat’s half birthday/the grocery store had your favorite brand of almond butter on sale/you just got a bag of Now Foods‘ perfectly roasted and salted buttery macadamia nuts (Seriously, try this brand of nuts if you can. They’re perfect. )/you woke up and wanted a blondie. Oh and speaking of almond butter, can I interest you in a riveting list of all of the ways you can adapt these to make them your own? What’s that? You thought I’d never ask? Use nearly any nut or seed butter, keeping in mind not to use anything that clashes with the flavor of the add ins. I suggest sun butter as an alternative, but you could also try cashew butter or maybe walnut butter. Use a different kind of dried berry if you don’t have cranberries handy. Cherries would also be delicious, or maybe even blueberries. Use homemade or store bought white chocolate. If you opt for the homemade, don’t forget to chop it to size, then freeze it and only incorporate it into the batter at the very last second before you pour the batter into the pan and shove it into the oven. Otherwise, it melts in the oven and you just get these greasy spots in your blondies. No one wants that. Under bake them slightly and use a cookie cutter to cut them into festive shapes. Eat them directly out of the pan with a spoon, no questions asked. Top with ice cream? I love you, blondies. Will you be my valentine? 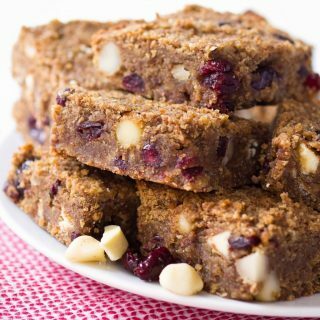 Dense, moist and tender gluten free and paleo white chocolate macadamia nut blondies that are studded with dried cranberries for a pop of color and flavor! Preheat the oven to 350F. Grease an 8" square baking dish and set aside. In a large mixing bowl, whisk together the flours, granulated sweetener, salt and baking soda. In another bowl, beat the egg, and then stir in the nut butter, maple syrup, vanilla extract, and almond milk until smooth and completely combined. Pour the wet ingredients into the dry ingredients and stir to completely combine. 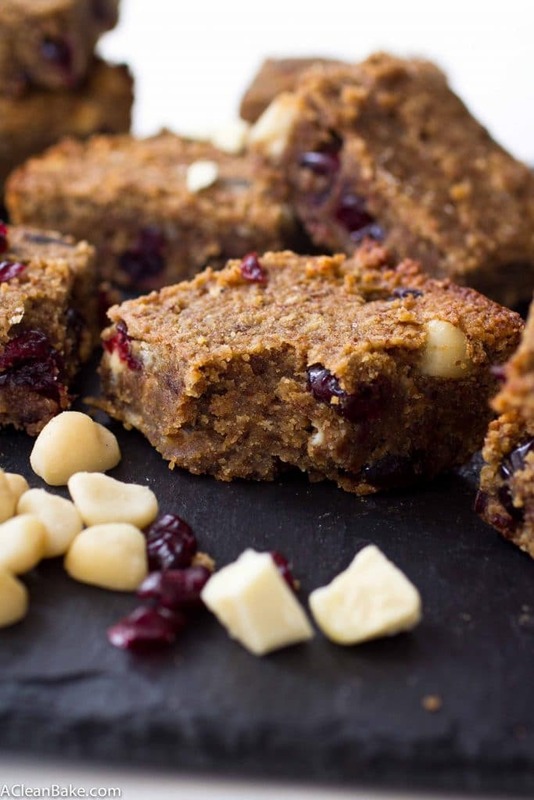 Fold in white chocolate, macadamia nuts and dried cranberries. Pour batter into prepared pan and gently smooth into an even layer. The batter will be very thick, so be sure to work it into the corners, etc. Garnish with additional chocolate, nuts and cranberries, if you want. Bake for 35-40 minutes until the edges are golden. Cool completely in the pan before slicing. You can use nearly any nut or seed butter, keeping in mind not to use anything that clashes with the flavor of the add ins. I suggest sun butter as an alternative, but you could also try cashew butter or maybe walnut butter. 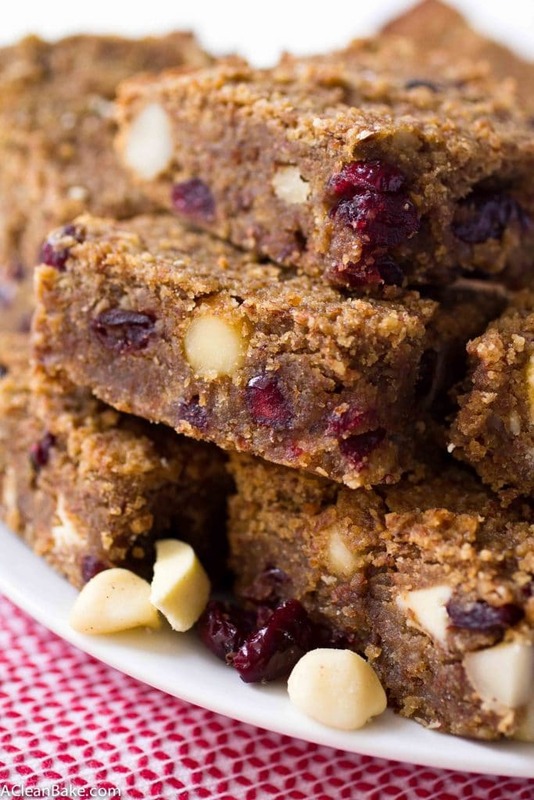 Use a different kind of dried berry if you don't have cranberries handy. Cherries would also be delicious, or maybe even blueberries. 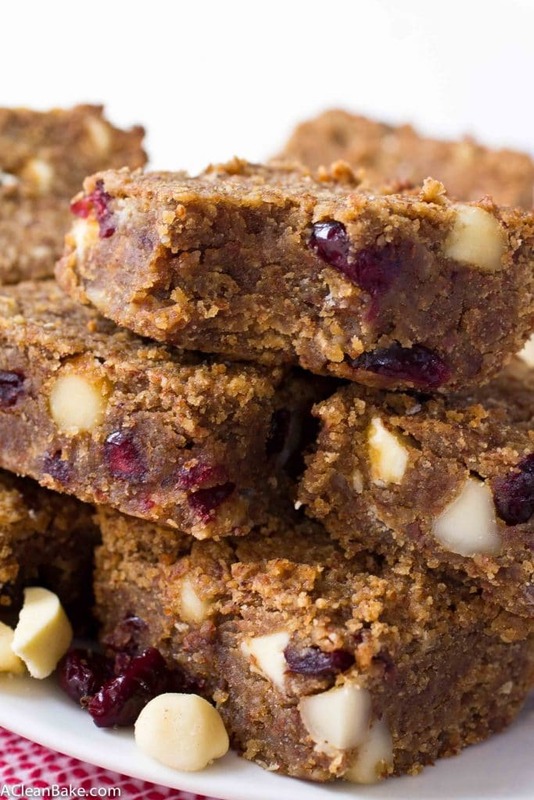 These work with homemade or store bought white chocolate. If you opt for the homemade, don't forget to chop it to size, then freeze it and only incorporate it into the batter at the very last second before you pour the batter into the pan and shove it into the oven. Otherwise, it melts in the oven and you just get these greasy spots in your blondies. No one wants that. If you can't use baking powder (as it often contains a small amount of cornstarch), you can you 1/2 teaspoon baking soda instead. However, you may not want to use sun butter, since it reacts with the baking soda and turns the blondies slightly green! Be careful not to overcook these! The tester probably won't come out entirely clean. That's because these continue to cook and firm up as they cool. I know it's a lot to ask but they have to cool to room temperature before slicing, or else they will totally fall apart.Chill them in the refrigerator to make them easier to slice cleanly. These look fantastic! They do look totally perfect for valentine’s day 😛 Great use for that homemade white chocolate too! Oh no, my cat’s half birthday–I think I might have missed it this year! Better whip up these blondies real quick to make up for it, right? They look amazing, Nora! Oh no! Yes, you should probably make a double batch, just to be sure! These look super yummy! Excited to try them! Let me know what you think of these, Alana! I really love your reasons for making blondies. Great points. You can never go wrong with a blondie!! Isn’t it funny how a blondie cures all that is wrong in the world!? What can I sub for the macadamia nuts? Walnuts would be great in this. I just made this and it was delicious! I did substitute a few things in though-I didn’t have maple syrup so I put in greek yogurt instead and upped the granulated stevia to around 4-5 tablespoons and put in semi-sweet chocolate chips because I didn’t have anything on hand. They still turned out so good and fudgy and I cannot stop eating them! Wonderful to hear that those subs worked and that you liked the recipe! Thanks Emily! !